Following the great success of its latest 46 m and 54 m yachts - the Baglietto 46m Fast and the MY Unicorn - at the European boat shows and the signature of a sales agreement for the first MV19, Baglietto continues to strengthen its brand on different markets by also developing new products - mainly the result of the interpretation of the specific requirements and wishes of some owners - and will soon be introducing some of these to the American market, too. The new V_LINE, which features yachts between 40 and 55 meters in length characterized by very contemporary lines and a vertical bow, keeps growing. The first two vessels, penciled by two leading Italian design firms, Francesco Paszkowski Design and Hot Lab, whose projects were introduced in Monaco, have now been joined by three more masterpieces: design firm Santa Maria Magnolfi has indeed signed a 41 m, a 50 m, and a 55 m displacement and semi-displacement, steel and light aluminum alloy yachts - each having a strong identity and drawing inspiration from Baglietto's history and elegant, iconic style. “Over the last few months our ability to develop and launch new products while preserving our traditions has impressively sped up – comments Baglietto’s Managing Director Michele Gavino - We liked the idea of having our reference designer, Francesco Paszkowski, who has written and will keep writing glorious pages of Baglietto’s history, joined by some new, young designers, who can cast a new, fresh look on our brand and reinterpret its personality without ever losing sight of its unbreakable ties with its history and identity". Sober and essential lines characterize this 41 m elegant, sophisticated vessel, whose sheer line, running uninterruptedly from bow to stern, results in even more streamlined volumes and harmonious profiles. The exteriors can boast huge common areas, totaling more than 300 sq m divided over the yacht’s 3 decks. The sundeck is approximately 60 sq m wide. On the upper deck, moving forward from the helm station, a large C-shaped sofa overlooks the spacious sunbathing area with a pool, creating a wonderful day area that allows to enjoy life in the open air and take in spectacular views. The interiors are wide, open, with large, often full-height, glazed surfaces. In particular, the main deck salon has been designed by conceiving the dining area as the ‘center of gravity’ between the interiors and the outdoor areas, and allowing to use it both as a traditional indoor dining room and, once the glazing dividing the salon from the cockpit is entirely opened, as a deck that opens onto the outside. In this way, the living room has been moved forward, exploiting the available width to the fullest. “In designing this 41 m vessel we had the honor and the burden of having to preserve some of Baglietto’s historical elements and stylistic features - such as the two round portholes on the main deck (reminding of the inimitable 20 m) or the curved corner glass on the helm station (which immediately recalls the first Ischia)- while also reviving and renovating the fiery, passionate spirit that has made this brand truly special over the decades" states Federico Santa Maria. Baglietto 44m V-Line by Francesco Paszkowski Design Slender, rakish, contemporary lines characterize Francesco Paszkowski’s design style. For more than 20 years, Francesco Paszkowski has successfully penciled Baglietto yachts, which now, while remaining faithful to the ‘seagull brand’s unmistakable style, stand out against other vessels thanks to their vertical bow. Aft, the wide beach club meets another increasingly frequent demand from the market. The spacious master cabin extends over the entire width of the main deck, while the guest area can be easily converted into a suite thanks to the adjoining modular walls. The approximately 100 sq m sun deck features a pool and a large sunbathing area. A dynamic, but never aggressive, design for the Baglietto 44 m, penciled by Hot Lab drawing inspiration from architecture, especially as regards the vertical structures and glazed surfaces and the 'car design' that characterizes all shapes. The most distinctive element on this yacht is the high, vertical bow, further emphasized by the slightly forwardtilted windshield located a little backward from the bow. At the other extreme, the stern features a large garage door which, when lowered, converts into a comfortable platform, giving access to the aft garage. The full-beam master stateroom, located forward, gets plenty of natural light thanks to the large windows and a skylight obtained in the table of the outdoor lounge. A balcony can also be found forward, which can be reached via a beautiful glass door. Hull engineering on all projects has been carried out by Baglietto Engineering Department. All yachts are under 500 tons and will be equipped with two Cat 32 ACERT engines that will push them to a maximum speed of 15 knots and a cruising speed of 11 knots. Both 44 m models will also be available in a hybrid version. 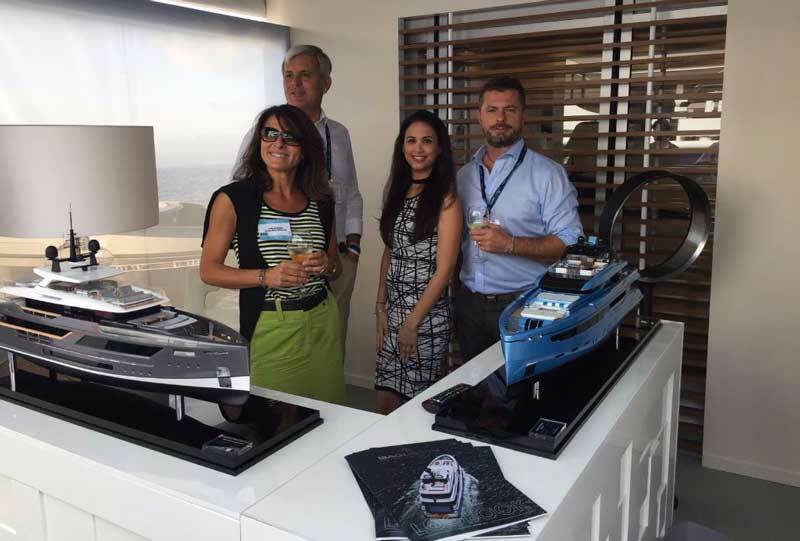 Besides focusing on product research and development, Baglietto is also considerably investing in its operating facilities and human resources. By 2020, investments will total approximately €12 million. After allocating €20 million over the last 4 years for the construction of 2 new industrial sheds and the upgrading of the entire production facility to the highest construction standards, further works at the shipyard are now involving the construction of a third industrial shed for vessels up to 65 m long and a new sheltered dock.